Is there anyone alive that doesn’t LOVE a fresh warm batch of homemade Chex mix? It is a special treat in our house that makes everyone happy. We love to add goldfish pretzels for fun surprise and candy pumpkins to make it a Thanksgiving treat that your family will love! For special occasions you can always smell the aroma of fresh baked homemade Chex mix in our house. The kids love it and so do my husband and I. So much, that I usually make a triple batch so we have enough to last a few days! 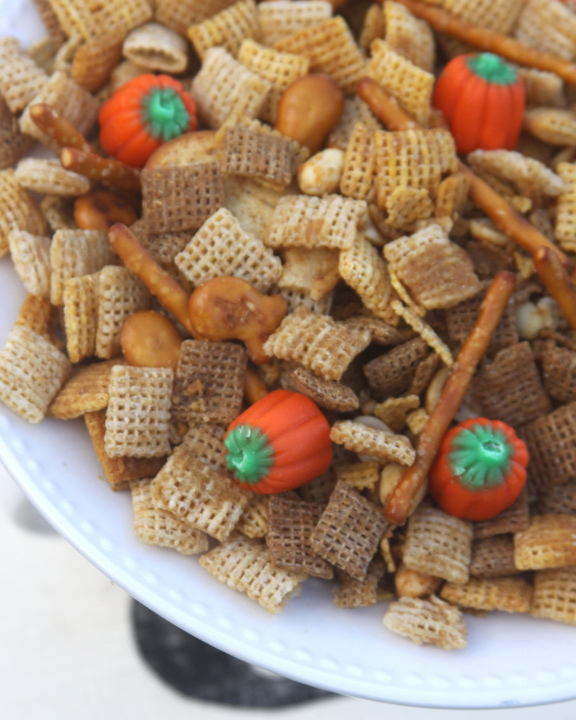 I use the traditional Chex Party Mix Recipe but go pretty heavy on all the fixings. A little extra butter goes a long way! To make it super fun for the kids I love adding the little pretzel goldfish. They enjoy fishing out the little guys and always announce when they have found them. I think they taste great added into the mix too. 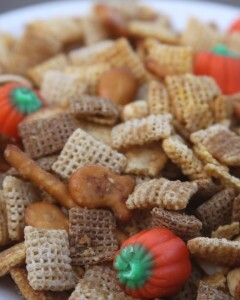 As an added treat after the Chex mix has cooled I sprinkle in a few candy pumpkins. It makes for a fun and festive surprise this time of the year. This would be a great snack to take to your upcoming Thanksgiving parties that will have everyone hovering around the snack table! Sounds like a good snack to have around while everyone waits for the turkey and fixins to get done. The sweet little pumpkins seem like they’d be a yummy contrast to the salty spices in regular chex mix. Ok I have too many things I want to make for thanksgiving now! That food blog I’ve told you about… Iowagirleats.com has several thanksgiving recipes that she’s posted over the past week…you should check it out if you’re looking for a new twist on some of the thanksgiving classics…I think you’d like it. I will for sure check it out!